So there I was thing morning, killing time with my iPhone by taking a panoramic photo while waiting for breakfast at the local spot. 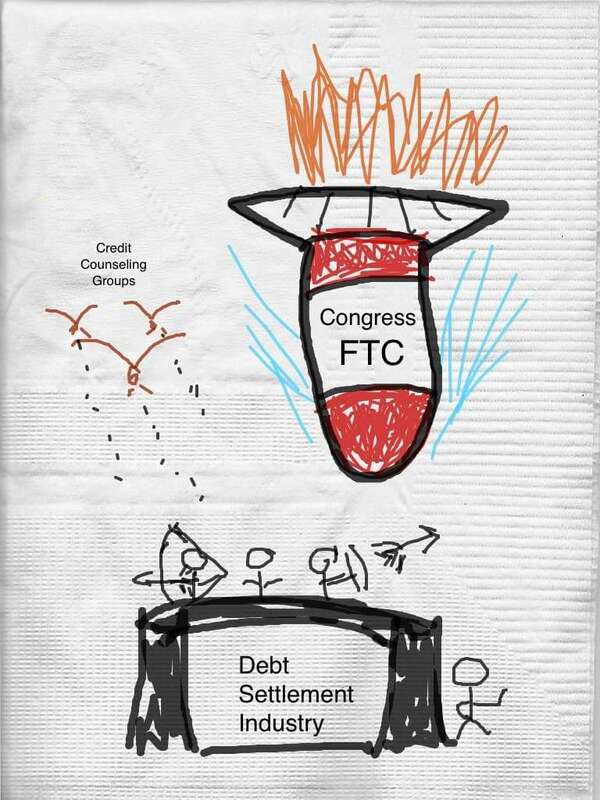 Since I had time to kill I started doodling and here is my final version of how I think the Senate hearings on debt settlement and the new upcoming credit counseling sponsored legislation to control debt settlement are going. One thing is for certain, I can’t draw, but that never stopped me from trying. LOL. And for the record, the DS guy on the right is supposed to have his hand on his hip, not playing with himself. Is there a particular reason you are trying to avoid bankruptcy? Did Conquest tell you to stop paying your creditors? Well, who really wants to file bankruptcy? Yes, they told us to stop paying them, but some of the minimums had gotten so high we couldn’t pay them timely anyway. We only stopped paying the ones with outragous minimums (int. rates were 29% and higher). We are still paying some of our creditors and timely. Well if you need to either discharge your debt or have a monthly payment you can afford, stop collections, avoid lawsuits, and have no tax liability then you should consider bankruptcy. Not considering it would be an expensive mistake. Find a local bankruptcy attorney and go talk to them before you fall for what a debt settlement wants to tell you to make a sale. We have $50,000 in credit card debt. We have been told by an advisor that he can help us get out of debt without bankruptsy. He said he can cut what we owe by 40-50%. When I figured the monthly payments he presented to us for 5 years it came out to being the same amount we owe. How does he figure the percentage? That didn’t make sense to me. You’re right to question that. That’s hardly helping you out of debt for less. And don’t forget that once you fall behind on your bills for the debt settlement program you’ll have to add in additional interest, fees and penalties the creditors can legally charge you. Say we don’t fall behind on payments to debt settlement…how can he claim he cut the debt? Should we trust this guy? AND if he were to save us 40-50% would the amount we didn’t pay back be taxable income to us? The way debt settlement works is you are either behind or you fall behind to encourage the creditors to deal with you. The debt settlement company makes the claim to the creditor that you can’t pay because you are having a financial hardship and they should consider settling. The salesperson and company have no authority to cut your debt.